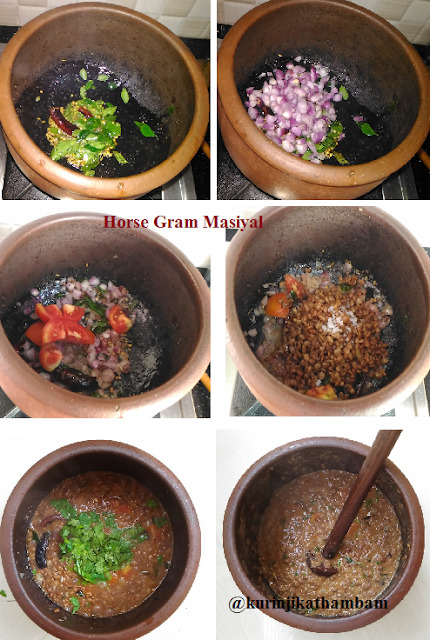 Horse Gram Masiyal is the Horse Gram equivalent of yellow dal maisyal which is very popular; I find it surprising that people outside of Kongu region do not prepare this regularly; This is a very energetic as this was given to Horses earlier for giving them high energy. 1. Peel the skin of the onion and wash them well. Then chop them into fine pieces. 2. Wash and chop the tomato into small cubes. 3. Wash and chop the coriander leaves into very fine pieces. 4. Heat the oil in a pan, add mustard seeds and wait for splutter. 5. Then add urad dal, cumin seeds, coriander seeds, red chilly (split it into two halves) and curry leaves. Sauté for a min. 6. Then add the chopped onion (from 1) and fry till the onion becomes translucent. 7. Now add the chopped tomato (from 2) and fry till the tomato becomes mushy. 8. Now add the cooked dal and salt. Add little water and cook for 5 mins. 9. Switch off the flame and add the coriander leaves (from 3). 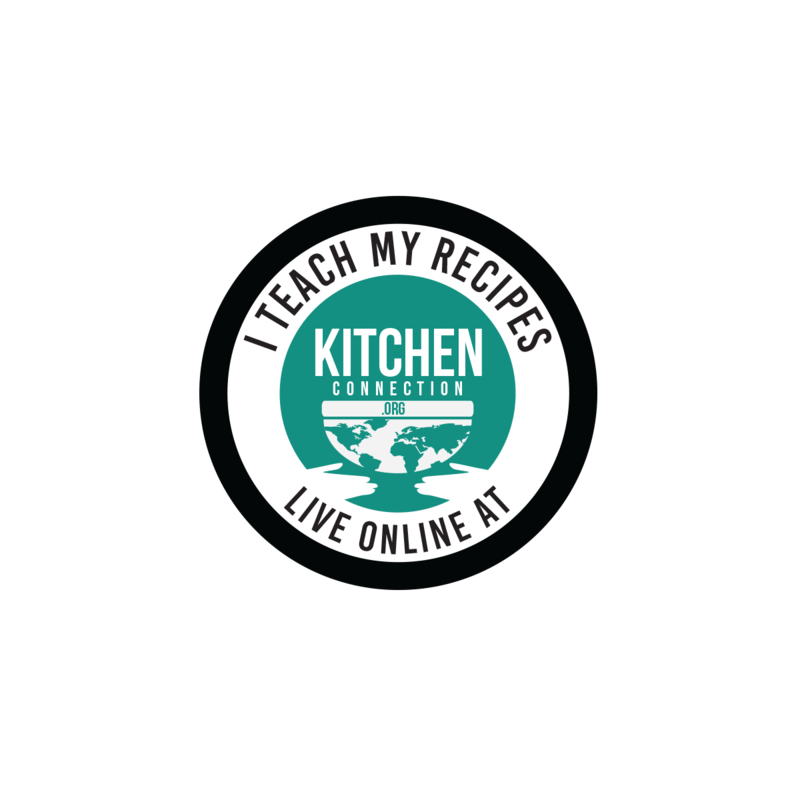 Then blend it into a fine paste using the hand blender or electric blender. 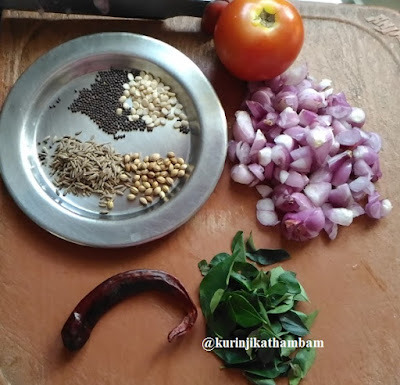 Serve this masiyal with hot white rice. 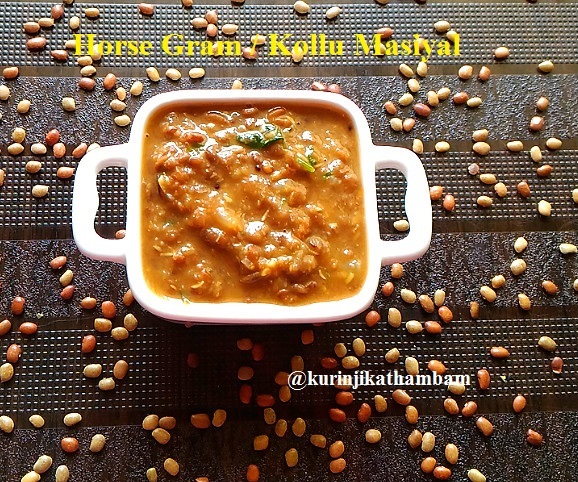 Click here for more horse gram / kollu recipes.